Hello, pipers and drummers. Registration is now open for the 12th annual Austin Piping and Drumming Competition! Entry must be postmarked by 19 May 2019, or submitted online by 21 May 2019. The tickets for this event are sold out. 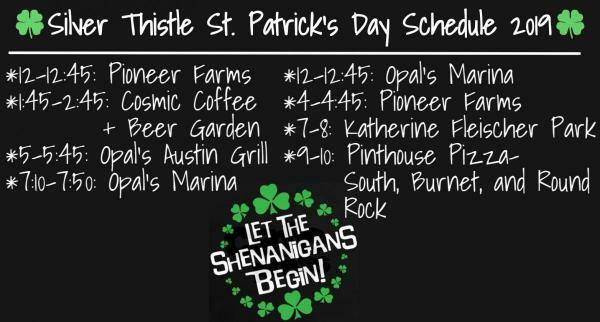 Please join us next year and come out to support Silver Thistle all over Austin for St. Patrick's Day. Sláinte! Join us for an evening honoring Robert Burns, the national bard of Scotland. Join Silver Thistle and more as we celebrate the holiday season in a performance at Celtic Christmas at The Cathedral on Friday, Dec. 21 and Saturday, Dec. 22. Click the link below for more info and to buy tickets. On Saturday, Nov. 10 (9am – 6pm) and Sunday, Nov. 11 (9am – 3pm), join us at the Salado Civic Center grounds on North Main Street to enjoy all things Scottish.